The book also received **starred reviews** from both Library Journal (February 1) and Publishers Weekly (January 1). LJ says, "this masterpiece is actually even better than the hype," and PW calls it "a tour de force." From the author of the acclaimed Equinoxes comes a return to roots that serves as spiritual renewal. Comics artist Simon Muchat is stuck. 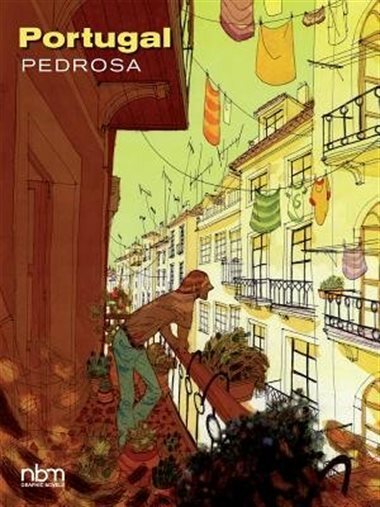 Suffering writer's block, uninspired, vegetating as a school art teacher, he is losing direction and his taste for life, until one day he is invited to appear at a comics convention in Portugal, the country his family came from and which he hadn't seen since his childhood. Even though he is a foreigner there, so many elements of the country are familiar to him. Meeting its lively citizens and recounting early memoreis brought by back his distant yet welcoming family all prove reinvigorating—the breath of fresh air he so badly needed. Based on his own experience, Pedrosa narrates this return to his roots in a deeply compelling and warmly human way. This bestselling graphic novel has sold more than 100,000 copies in France and a has won many prizes, including Best Graphic Novel at the Angouleme Festival and FNAC Best GN.